These free printable gift tags will add that extra special touch to your gift without you having to shell out any extra money. These printable gift tags look great and will just take you a few minutes of time to print them and attach them to your gift. No need to spend any money when you have something that looks this good! There are some great Christmas gift tags that look wonderful, but if you're looking for an all-occasion gift tag, look no further. These gift tags look great on whatever paper you use, but really shine when printed on card stock or linen paper. They also become even more convenient if you print them on sticker paper. Dawn Nicole Designs has created these lovely printable gift tags that are free for you to download an use as much as you like. This collection of gift tags are great for just about any occasion, from a thank you gift, to a birthday gift, to a "just because" gift. All the backgrounds are white making it easy to write your message if you have one. The colors are bright, in shades of pink, blue, green, and yellow. Live Laugh Rowe has designed these lovely free, printable birthday gift tags that are decorated with beautiful watercolor flowers. There are four different designs and they can be printed out on one page so you can use as many as you like. These "Made With Love" gift tags from She Wears Many Hats will go perfectly with anything you've homemade including food, bath items, or even a quilt. These printable tags are available in all black (which looks great when printed on printable kraft paper) and black with a red heart. After you've printed them you can cut them out, punch the hole, and attach them with baker's twine. These ice cream gift tags would look great on a birthday present or even a summer housewarming gift. They print 4 to a page in pink, green, blue, and yellow. These vintage-inspired gift tags from Blooming Homestead makes a wonderful way to say thank you. There are three different designs with arrows, flowers, and hearts. 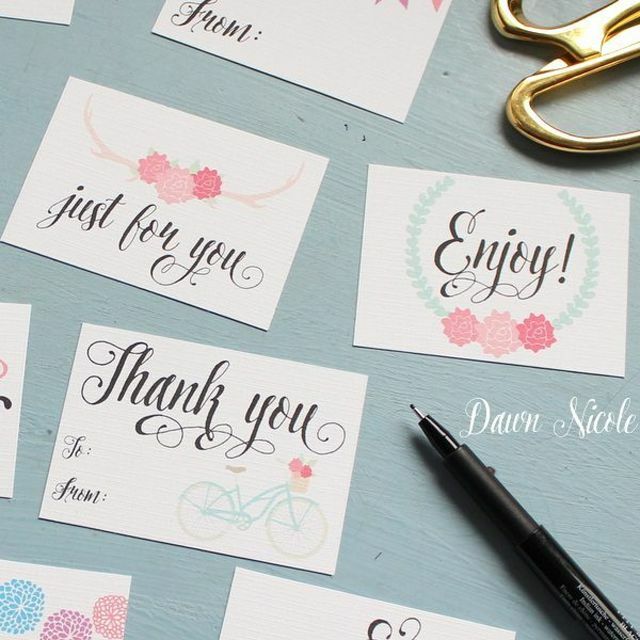 Meghan Makes Do has designed some beautiful thank you gift tags that simply say "Thank You." These look great printed on kraft paper or any color of cardstock. The tags are available as a free PDF download that lets you print off 6 tags per page. After they are printed, simply cut them out and add a hole so they can be attached to your gift. There are 4 different designs of printable gift tags here that say "Celebrate", "Congratulations", "For You", and "Best Wishes." Each tag has a completely different look, making them a great set to download and use for almost any occasion. You'll print these from a PDF file that has 8 gift tags (2 of each design) per page. Cut them out and attach a string and your gift is ready. Here are some printable gift tags for all of us who remember the good 'ole cassette tape. 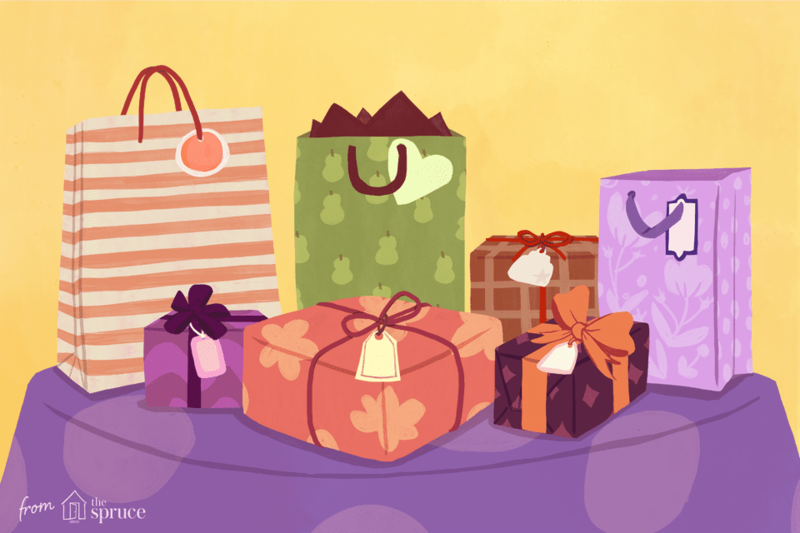 There are all kinds of styles of gift tags here and they'd look on a gift for just about any occasion. Dots Tags by Hello, Good Gravy! These are some very bright and cheerful printable gift tags in red, orange, green, blue, pink, and purple. These look great with a whole punched through the top and a ribbon strung through. These free, printable gift tags are truly inspired by nature with images of birds and squirrels. You can print 8 gift tags per page of these. I just adore this lovely green gift tag that features a single bird. It can be printed in three sizes—small, medium, and large. There's also another printable gift tag here that features some flowers.